A roll cake is essentially a sponge cake baked in a sheet pan, then rolled around a filling. In this recipe (and many others for roll cakes), you beat the egg yolks and whites separately. It makes for a light, airy cake, and I also read that this process helps make the cake more elastic, so less prone to cracking when you roll it up. I divided the chocolate cake recipe in half. The original recipe called for 5 eggs and I made things simple by using 2 extra-large eggs. I typically always have both large and extra-large eggs in the fridge. You end up with a foamy batter (as you know, be sure to fold gently and spread with a light hand so you deflate the batter as little as possible). 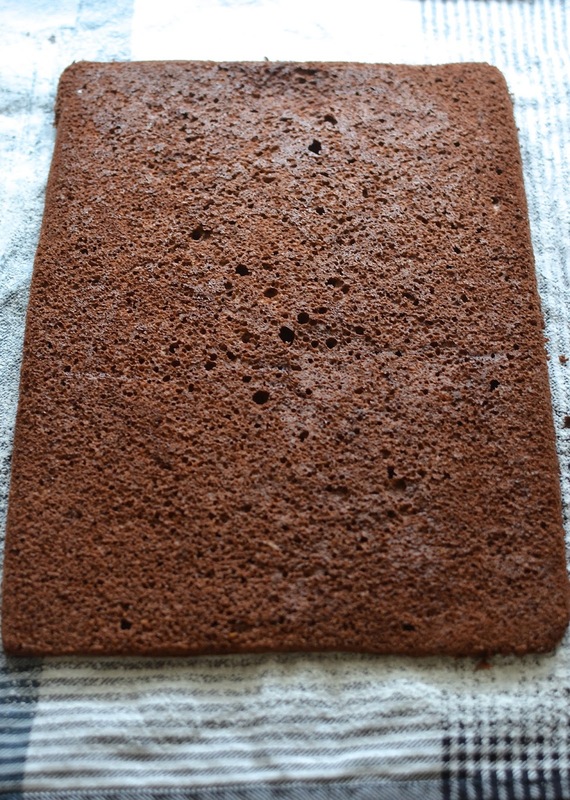 I baked the cake in a quarter-sheet pan, measuring 9x13 inches. When the cake is done, it will spring back slightly when gently pressed. Turn it out onto a clean dish towel dusted with confectioners' sugar and peel away the wax or parchment paper you lined the pan with. Then, it's time to roll it up while the cake is still warm. Allow it to cool completely this way, seam side down, on a wire rack. While this cake was cooling, I went out with my family and when we got back, I whipped up the mocha cream filling and unrolled the cake. This was the part I was nervous about but aside from some sticking, there were no cracks or major issues. The filling is made with half a cup of heavy cream, flavored with cocoa powder and espresso powder, along with a little sugar and vanilla extract. I spread this around my cake roll, leaving a little border along the edges. One last careful roll back up and I was done! Roll cake success! The cake was very moist and light. There's chocolate flavor with a pop of coffee with the mocha filling. It's one of those desserts that goes down easy and disappears quickly. The fellas were big fans and enjoyed every morsel, which makes me feel very merry! This cake was one of the desserts I made over the long Thanksgiving weekend. We look forward to that weekend so much every year because we're all home and we get to not only celebrate Thanksgiving but usher in the holiday season. There's no need to rush, I get to cook and bake to my heart's content, and we all get to sit down and share it all together (and it seems like we're sitting down to a meal all the time). This really is the best time of year! Here's to a very happy holiday season! Did you realize there's only 3 weekends before Christmas? Time to get baking and celebrating!! Make cake: Preheat oven to 350 degrees. Lightly coat a quarter sheet pan (9x13 inches) with baking spray. Line the bottom with wax paper and lightly spray paper with baking spray. Whisk together flour, cocoa powder, baking powder, and salt in a bowl. Place egg yolks, 2 tablespoons sugar, and vanilla in the bowl of a stand mixer (or you could use a handheld mixer). Beat, with the paddle attachment, on medium speed until light and fluffy, about 3-4 minutes. In a separate mixer bowl, add egg whites and cream of tartar. Beat, with the whisk attachment, on medium speed until foamy. Increase speed to high and continue until soft peaks form. Slowly add 1/4 cup sugar, a tablespoon at a time, until stiff peaks form (do not overbeat). Stir one-fourth of the egg white mixture into the egg yolk mixture. Gently fold in the remaining egg whites. Sift the dry ingredients over the top of the egg mixture and gently fold together (trying to deflate the batter as little as possible). Spread batter lightly and evenly onto the prepared pan with a small offset spatula. Bake until cake springs back when lightly touched in the center, about 8-9 minutes. Loosen cake from the sides of the pan. Turn out onto a clean dish towel that's been dusted with a tablespoon of powdered sugar. Carefully peel off the wax paper. Let cake cool for 1 minute, then starting from the short end, roll up the cake and towel together. Place, seam side down, on a cooling rack and let cool completely. Make filling: Place vanilla extract, sugar, cocoa powder, and espresso powder into the bowl of a stand mixer (a cold bowl and whisk speeds up the process). Add about a tablespoon or so of the cream and stir to form a thick paste (dissolving the cocoa and espresso powder in the process). Add remaining cream and whip until stiff peaks form. Assemble: Unroll the cake carefully, removing the towel and setting the cake onto a piece of wax paper. Spread the mocha cream filling over the cake, leaving about a half inch or so border along the edges. Carefully reroll the cake into a log (use the wax paper to help you and remove the paper as you go along). Place the rolled cake, seam side down, onto a platter. Cover and chill for at least an hour. Before serving, dust with powdered sugar. That's a perfectly baked chocolate roulade, Monica. And the serving plates are very festive! 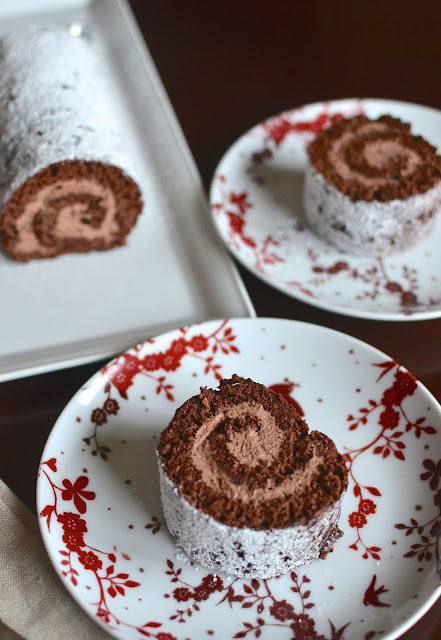 This roll cake is stunning and that fluffy chocolate frosting inside looks to die for- maybe I'll try an conquer my roll cake fear now! I still have yet to try making a roll cake! I love the sound of that mocha filling! Right up my alley! Oh gosh I know, I feel like the holiday season just got here and yet it's blowing by! It seems like a lot of effort with that towel and everything, right? It's not so bad and it's not super rich so lots of people seem to enjoy it. Speaking of enjoy...savor this month, it'll fly by. Oh I wish i knew how to make so nice looking roll cakes! Looks very yummy! You have totally inspired me with this, Monica! Those yule logs with all the trimmings are so pretty but surely WAY too time consuming, but this is just as beautiful and you make me think I can muddle my way through with those step by step photos. You are so sweet, Jess. Thank you so much...but I can't picture you being daunted by a roll cake. You could make one easy, even with the 2 adorable twins around, I just know it!! oh my! That looks so perfect and YUMMY! Hi Monica, oh this is gorgeous, the perfect holiday dessert. I can see why your husband would like you to make a bigger roll next time. Definitely a large/regular one next time. It goes down way too easy! Thanks and enjoy the holiday season, Cheri. This is the worst thing to look at when you are hungry. Great presentation, and photography. Appreciate it - thanks for the kind words! 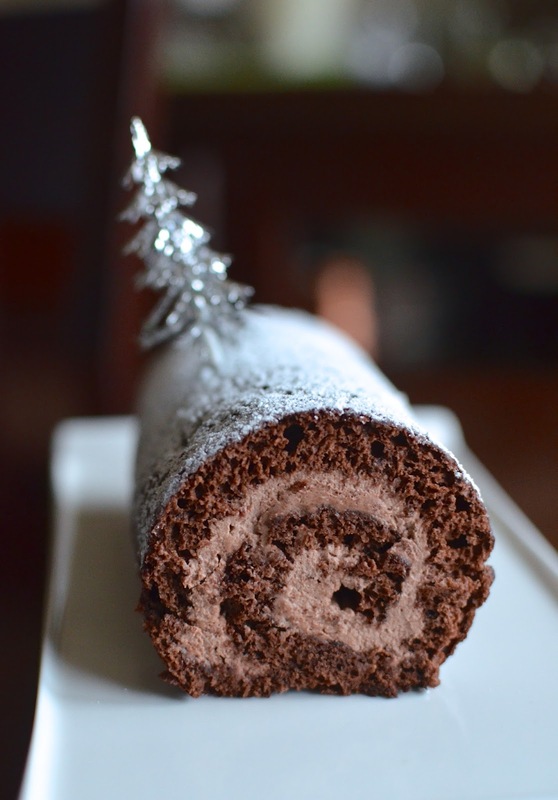 This such an elegant roll Monica...and perfect to share during this holiday season...thanks for sharing the recipe. I'm glad other people get a little nervous about it, too! : ) I'm glad you think it turned out well. Yay! This is awesome!! I love getting different dessert ideas for Christmas besides just cookies! Cookies rule at Christmas but a cake here and there, and a little variety, is so fun! Happy Holidays! 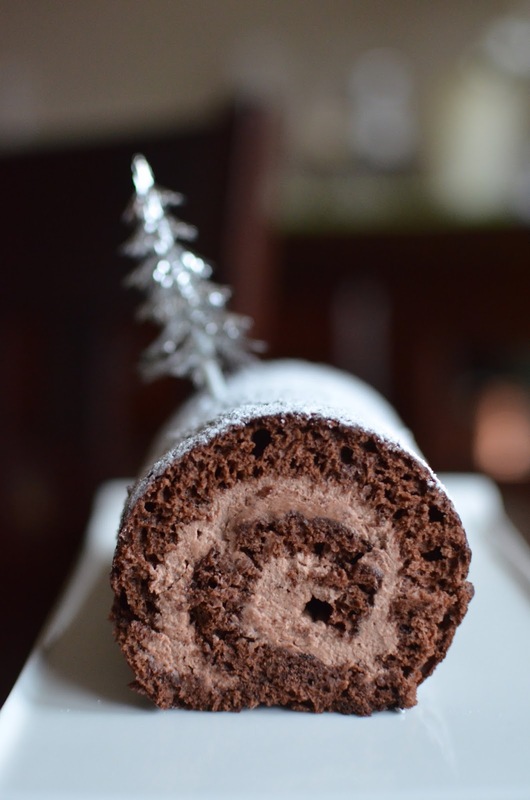 This cake roll looks spectacular! A lovely holiday treat idea. It is perfectly baked! It looks so soft and moist, plus chocolate and mocha are an amazing combination. The process of folding in the separately whipped whites really makes for a moist cake. Thanks, Mary! Wow! This cake is stunning! I love roll cakes...especially during the holiday season! That mocha filling sounds very delicious! I tried making a swiss roll once, but I had a little issue with the rolling. Yours is flawless! I am going to try with your recipe next time! By the way, the red plates are so gorgeous. Where did you get them? The filling is so easy and tasty...the magic of heavy cream? ; ) Thanks so much...and the plates...they're made by Rosanna but I actually bought it a couple of years ago from Barnes & Nobles; it was made specially for B&N. I have a little rectangular platter that matches and I kick myself for only buying 2 of these plates. It's getting harder and harder to find cute plates and such. 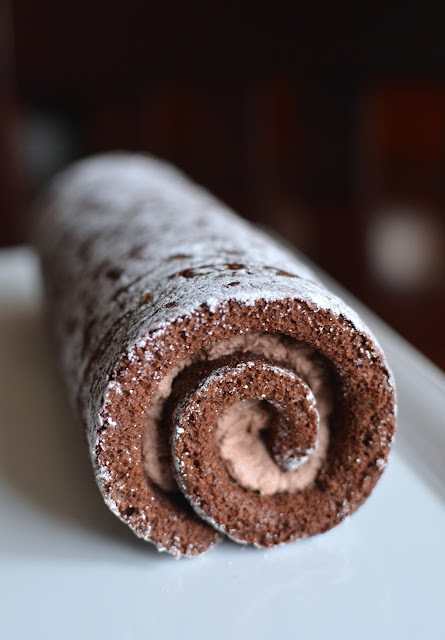 Love the mocha cream filling in this cake roll! Perfect for holiday parties! Thanks...I'm going to make it for my family again one day soon. Just beautiful! I am impressed by how smooth you get your the cake.Those look yummy! I think I can successfully do those. Can you replace brewed coffee for the instant espresso? I don't think so. Brewed coffee wouldn't give you intense enough a coffee flavor and adding too much liquid would impact the filling and make it too loose and wet. i did end up using strongly brewed coffee and it turned out great. Hi can this be made a day ahead before needed? Sorry, thought I replied to this already. Yes, making a day ahead should be fine. I believe the last time I made it, I did it the night before. You are just concerned about the whipped cream but if it's nice and stiff, and stored in a very cold refrigerator, a day in the fridge should be just fine.